Multimedia Laser Show - Video, Fire, Water, Pyrotechnics, etc. Combine your show, event, or performance with one of our multimedia laser shows. Through especially skilled placement of laser beams, laser projections, video projections, fire, pyrotechnics, light, fog, haze, water fountains, water screens or water shields,multimedia laser shows refrain a breath-taking vibrancy, which will astonish your audience. Our multimedia laser shows are a perfect start for large events like sporting events, openings, concerts and also musicals can be perfectly staged with the help of a multimedia laser show. 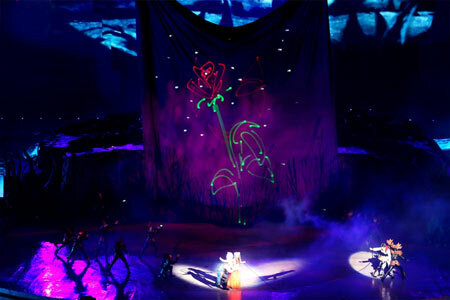 Take your audience on a journey to a colourful, mythically world, where elements like fire, water, fog and light harmonize perfectly and presenting a spectacle, which will amaze them. It is up to you to use the help of your qualified employees, but we’ll be happy to help you to visualize your laser show and with all questions about logistics. 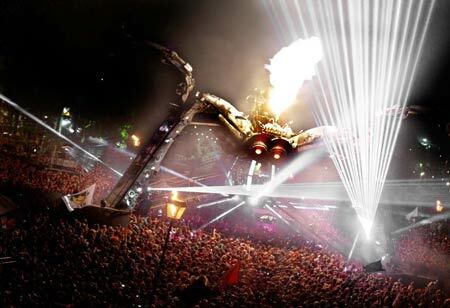 We believe that our individual designed laser show will perfectly optimize your show. So use this fantastic opportunity and enchant your audience. We offer complete project solutions for high profile multimedia shows together with our partners. All of them are specialized in conception, design and implementation of different scales of laser and multimedia show installations. Their longtime experience with projects of every size in the whole world make them the perfect partner for Laserworld. All our partners think and work in multi media: Not only the Laserworld show laser systems are integrated in their shows, but also video projections, water fountains, water screens, fog, haze, pyrotechnics, fireworks, etc. The approach to multimedia as done in a whole to provide the spectators an overwhelming, emotionalizing feeling when experiencing the show. Laser shows are an important part of modern multimedia concepts and our partners rely on the products of RTI, mainly on the NANO projectors series. These are perfect for outdoor use, as they are IP65 waterproof and thus seamlessly work in water spray or next to fog and haze machines. Therefore they stand for high power, quality and excellent technical specifications. Having all hardware products on site and mounted is not enough for generating real emotions for the spectators: It is crucial to have an harmonious, perfectly synchronized show that integrates all media in an artistic, choreographed way. Together with our partners we provide conceptions, artistic supervision and production of impressive and emotional multimedia laser shows. Different surfaces make laser light appear differently. 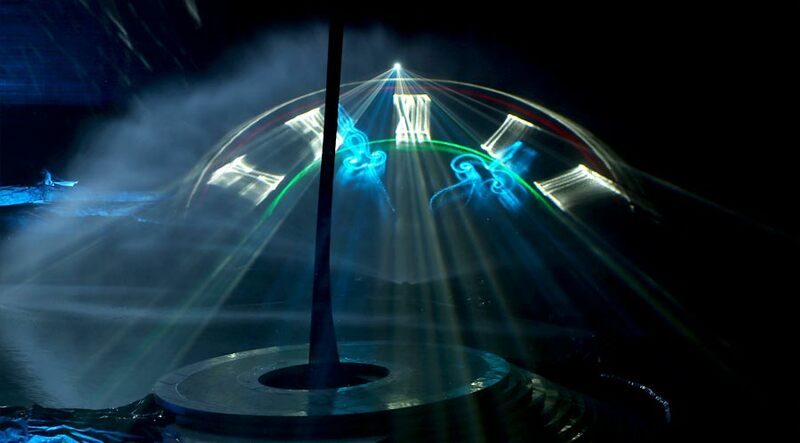 Very special effects can be achieved if lasers and water are combined: Water fountains in various kinds, water screens or even water spray can be combined with laser projections and atmospheric shows in many ways. 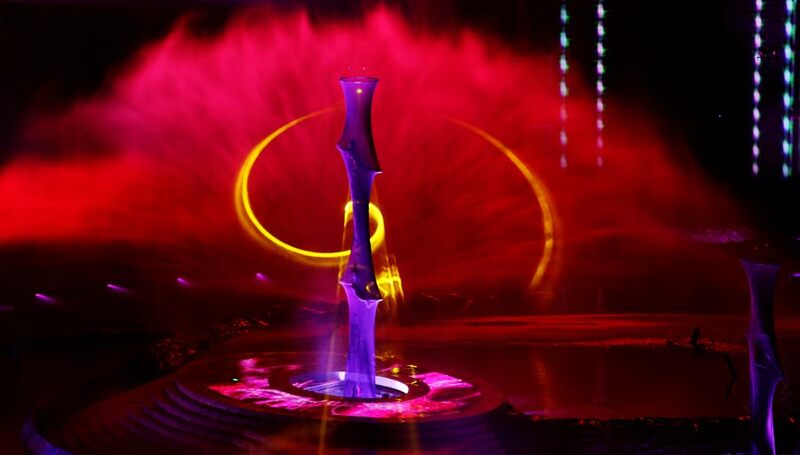 Water shields can be used as projection surface for laser and video projections, water fountains appear as voluminous, enlightened columns with gorgeous color effects if used in combination with show laser systems. Of course the fountains can be controlled music synchronous as well, so they can be seamlessly integrated in the whole multimedia concept. Water and fire are the contrast in elements - it's more than obvious to use fire elements in a multimedia show to emphase this contrast - or even make it appear not existing. Fire elements can be implemented in different ways: Normal pyrotechnical effects emphase the general apprearance of the show and can especially be used for creating additional tenseness for the spectators. These can be flame effects (that can be controlled music synchronous), explosion effects or stage fireworks. 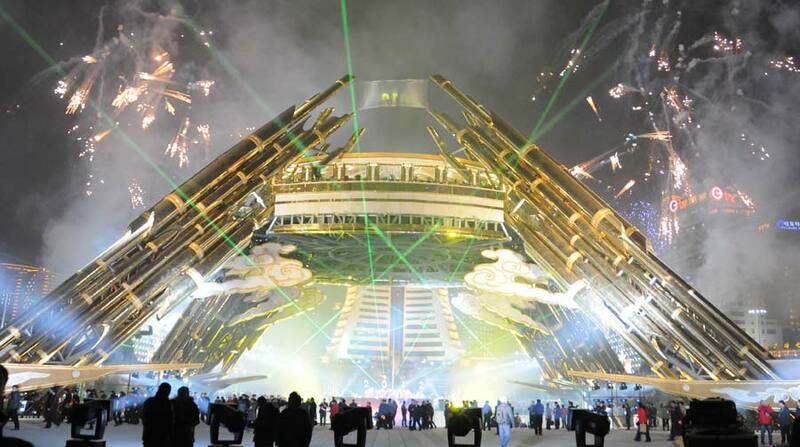 In addition to that is it also possible to combine multimedia shows with fireworks that reach high up in the sky. The smoke of the fireworks can even be used for additional laser effects in the sky. Glossary: What is a multimedia show?